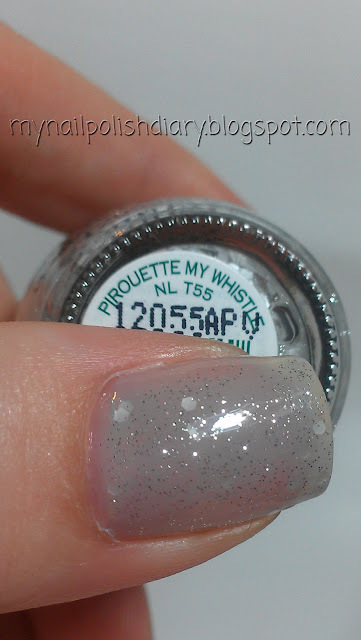 This is OPI Pirouette My Whistle over OPI My Pointe Exactly. Both are from the NYC Ballet Soft Shades Collection from this spring. This glitter top coat is SO gorgeous I am considering a back up! It totally transformed this mani from "ok" to absolutely stunning. I can't stop looking at my nails. They're sparkly but not over the top or in your face. I am really fond of glitter polish, but I tend to do it as an accent nail because it tends to be just a little too much for my taste. So as I always do, I polish my ring finger expecting I would only do an accent nail. WRONG! Once I saw how, I guess delicate?, it looked I did not hesitate to do the full mani with it. If you haven't seen this in person I recommend you run, don't walk, to your local beauty supply store and get yourself some of this yummy glitter. LOVING this one. It gave my nails enough tinsel strength to have my mani last more than 1 week! I did my normal base, then 1 layer of the new OPI Ballet sheers in the gray one, My Pointe Exactly - then Pirouette - then toppled that with a coat of clear to keep the gummy thing down from the gel it's in as I wanted to put a coat of the OPI new Ballet sheers over it all in the white one - Don't Touch My Tutu. I was amazed at how pretty it looked and also the time it lasted on! No tip wear and I only put a mid week clear topper of SV on it to pick up the shine. Nice way to do a fresh look on the jelly sands.